A combination of vitamins, minerals and plant-based phytonutrients to support the underlying structures of healthy skin, hair and nails. 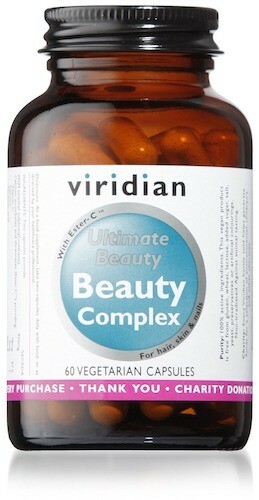 Take daily alongside Viridian’s 100% Organic Ultimate Beauty Complex Oil for the ultimate in hair, skin and nails. Biotin contributes to the maintenance of healthy hair and skin. Iron can contribute to the reduction of tiredness and fatigue and supports the formation of red blood cells and haemoglobin. Iron also supports the normal functioning of the immune system. Selenium, an antioxidant mineral, contributes to the maintenance of normal hair and nails, protecting the cells from oxidative stress. Vitamin C contributes to collagen formation for the optimum function of skin, as an antioxidant it also helps in the fight against ageing by free radical-induced oxidative stress. Vitamin C also increases iron absorption.